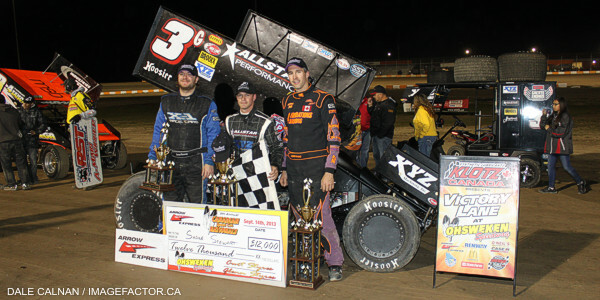 by Tommy Goudge (September 13, 2013) – Randy Hannagan and Bryan Howland gained guaranteed starting spots in the 2013 Canadian Sprint Car Nationals A-Feature by winning Friday’s “Night Before the Nationals” Twin 15’s presented by Burger Barn at Ohsweken Speedway. 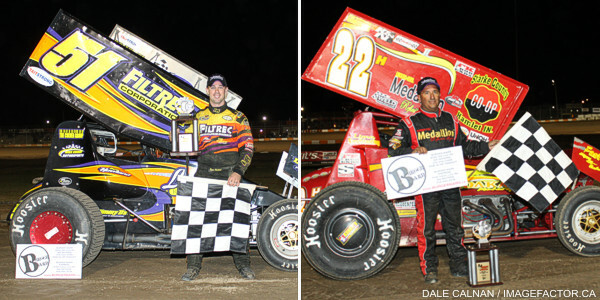 Jim Huppunen won the TJSlideways.com Ohsweken Shootout, Alain Bergeron won the Dave McLeod Memorial “Mr. Sprint Car Challenge”, and Dave Bailey won the HRW Automotive Mini Stocks feature. Randy Hannagan started on the pole for the first of the Twin 15 lap features for the Sprint Cars on Friday night, but Glenn Styres started on the outside of the front row and took the early lead. Styres led the first 10 laps before Hannagan tracked him down and made the winning pass. In his efforts to come back on Hannagan, Styres clipped the inside wall while negotiating traffic on lap 13, and damaged the left front tire and suspension on his car. Hannagan stayed ahead of Jason Barney to get the feature win, while Barney settled for the runner-up spot after starting 5th. Dylan Swiernik, Joe Trenca, and Robbie Stillwaggon rounded out the top 5. Jared Zimbardi and Jessica Zemken started on the front row for the second of the Twin 15 features, but Bryan Howland took the early lead, with Shane Stewart giving chase. Jared Horstman was fast in his heat race, but sustained damage on the first lap, and was unable to restart. Howland led the rest of the way, but Stewart was gaining quickly as the race wound down, and finished just 7 tenths of a second behind Howland. Jared Zimbardi, Dustin Daggett, and Jamie Collard rounded out the top 5. Heat races for the 53 car field were claimed by Jason Barney, Glenn Styres, Dylan Swiernik, Jared Zimbardi, Jared Horstman, and Jessica Zemken, while Jim Huppunen won the 10 lap TJSlideways.com Ohsweken Shootout event, and Alain Bergeron emerged as the winner of the Dave McLeod Memorial “Mr. Sprint Car Challenge” 1-on-1 match races. Brian Watson and Alex Schuts started the final Mini Stock feature of 2013 on the front row, but Dave Bailey started outside row 2, and wasted no time getting to the front in search of a feature win. Bailey led the rest of the way, with Davey Boughton, Alex Schuts, and Trevor Roszell giving chase. A caution flag flew late in the race when Jamie Goudge stopped on the front stretch with mechanical problems, giving Boughton a final chance at taking the win from Bailey. The restart proved fruitless for Boughton, as Bailey went on to take the win, while Schuts was unable to finish. Boughton took the runner-up spot, followed by Roszell, Jeremy May, and Mike Evers. The win was the second for the #31 at Ohsweken this season, as Mike Taylor drove the Bailey-owned car to the Art Hill Memorial 42 win in August. 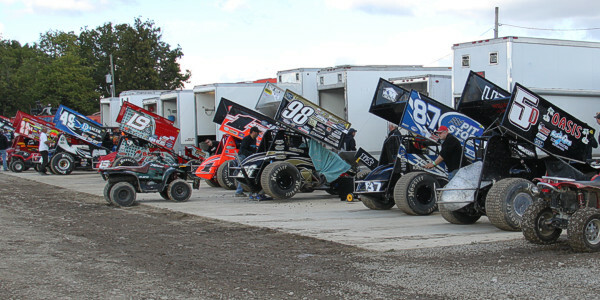 Heat races for the 21 car field were claimed by Dan Miller, Dave Bailey, and Alex Schuts. 1. 87 Jason Barney (Constantia, NY), 2. 98 Joe Trenca (Clay, NY), 3. 52x Scott Kreutter (Alden, NY), 4. 89 Robbie Stillwaggon (Burlington, NJ), 5. 28fm Steve Poirier (Saint-Mathieu-de-Beloeil, QC), 6. 49d Shawn Dancer (Delphos, OH), 7. 67c Steve Collins (Belfast, NY), 8. 15aw April Wilson (Joyceville, ON), DNF. 67 Chris Durand (Port Stanley, ON). Time – 2:23.226. 1. 0 Glenn Styres (Ohsweken, ON), 2. 55 Patrick Vigneault (Trois-Rivières, QC), 3. 422 Etienne Girard (Saint-Germain, QC), 4. 5 Keith Dempster (Alton), 5. 19 Brooke Tatnell (Sans Souci, NSW), 6. 30g Steve Goldner (Aylmer, ON), 7. 23 Joe Geibe (Sturgis, MI), 8. 70 Jim Lingar (South Bend, IN), DNF. 4 Eric Smith (Lakeview, MI). Time – 2:29.843. 1. 7c Dylan Swiernik (Port Leyden, NY), 2. 22h Randy Hannagan (San Jose, CA), 3. 81 Derek Jonathan (Lewiston, NY), 4. 19k Paul Kinney (Canastota, NY), 5. 49 Todd Hoddick (Cheektowaga, NY), 6. 123 Yan Bilodeau (Victoriaville, QC), 7. 94z Stan Zanchin (Fort Erie, ON), DNF. 43 Scott Sherk (Port Colborne, ON), DNF. 77x Wayne Johnson (Knoxville, IA). No Time. 1. 35 Jared Zimbardi (Bradford, PA), 2. 2m Dustin Daggett (Grand Ledge, MI), 3. 13 Kevin Ward, Jr. (Port Leyden, NY), 4. 80 Chris Steele (Vineland, ON), 5. 42w Rick Wilson (Joyceville, ON), 6.  o5 Brad Loyet (Sunset Hills, MO), 7. 0 Ryan Grubaugh (St. Johns, MI), 8. 31 John Burbridge, Jr. (St. Williams, ON), DNS. 6L Paul Lang (Port Colborne, ON). Time – 2:31.521. 1. 17 Jared Horstman (Cloverdale, OH), 2. 3g Shane Stewart (Bixby, OK), 3. 7x Jamie Collard (Burford, ON), 4. 14h Jim Huppunen (Fenwick, ON), 5. 07x Dain Naida (Tecumseh, MI), 6. 8b Alain Bergeron (Saint-Pie, QC), 7. 84 Tyler Rand (Consecon, ON), 8. 5c Conor Mahoney (Waterdown, ON), 9. 15 Mike Ferrell (London, ON). Time – 2:31.027. 1. 1z Jessica Zemken (Sprakers, NY), 2. 51 Bryan Howland (Auburn, NY), 3. 5b Justin Barger (Montrose, NY), 4. 16 Ryan Ruhl (Angola, IN), 5. 3r Shane Ross (Thedford, ON), 6. 21j John Burbridge, Sr. (Simcoe, ON), DNF. 5d Dave Dykstra (Port Colborne, ON), DNF. 10j Jeremy Hughes (Burlington, ON). No Time. 1. 79 Dan Miller (Paris), 2. 16 Jeremy May (Binbrook), 3. 43 Brian Watson (Hamilton), 4. 05 Dave Goodacre (Brantford), 5. 76 Jamie Goudge (London), 6. 96t Mike Taylor (Hamilton), 7. 66x Kyle Graham (). 1. 31 Dave Bailey (Hagersville), 2. 18x Davey Boughton (Carlisle), 3. 265 Mike Evers (Caledonia), 4. 66 Jon Janssens (Woodstock), 5. 29 Lucas Lubin (Hamilton), 6. 84 Jade Pelletier (Wainfleet), 7. 7x Steve Hess (Ohsweken). 1. 81 Alex Schuts (Oakland), 2. 7 Jason Lungaro (Hamilton), 3. 10 Trevor Roszell (Waterdown), 4. 90 Chad Smelser (Dunnville), 5. 22 Brittani Myers (Hamilton), 6. 11 Mike Giberson (Caledonia), 7. 12 Chantelle Hyatt (Millgrove). GENERAL ADMISSION: ADULT/SENIOR/STUDENT $25, KIDS AGE 12 &UNDER FREE!